Taking any IT program from concept and design through to implementation involves time, expertise and a dedicated team. As many businesses have limited IT resources, Questa Technology can put your plans into action while minimizing investments in time and technology spend. Focused on providing a long-term IT solution, our project managers implement best practices and maintain ongoing communications to ensure activities are meeting program requirements, timelines and costs. Utilizing Agile and Scrum methodologies, we take the best approach to program management to suit different programs and products that produce the best results for our clients. Following this project management process, Questa Technology works interactively with a team instead of just following an in-depth plan to address changing program requirements. 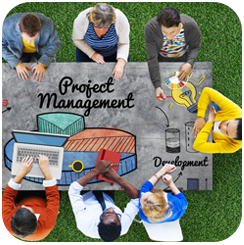 Dependent upon frequent inspection and adaptation, this project management approach promotes teamwork and collaboration with IT development aligned to customer-evolving requirements and goals. Often used to manage complex programs including software and product development, Scrum is a subset of Agile that utilizes development cycles called sprints to complete work within a specific timeframe. Our Scrum Master keeps the team focused and working together while monitoring the project to quickly address issues and bring the program to final implementation.